It's a basic principle, and one the Justices hearing the case raised over and over again during the trial in Gorenshtein v BC (Employment Standards Tribunal): in Canada, we don't make people buy jobs. Workers cannot be charged fees for jobs; it's strictly illegal. And yet, migrant workers who come to Canada under Canada's temporary foreign worker program, especially low-skilled streams, will tell you again and again that they are paying fees, thousands or even tens of thousands of dollars, for the promise of a low-paid, precarious job in Canada. We're fighting fees like these (and other exploitation) in the class action lawsuit that you can read about here. And we were thrilled to see the decision that came down last week from the BC Court of Appeal - not least because one of the lawyers arguing for the workers was our own Susanna Quail (ok, me, it's me Susanna writing this). That case was about two workers from Russia who came to Canada in 2008 as live-in caregivers. They contracted to pay $3,000 each in fees to an agency that placed them with employers in Canada. When they got here, they learned that the fees they had been charged were prohibited by law and applied to the Employment Standards Branch to have the fees returned to them. They also refused to pay the remaining outstanding fees. The Employment Standards Branch, meanwhile, concluded its process and found the fees were illegal, and ordered the agency to pay them back. The agency launched a very long series of appeals, reconsideration applications, and petitions for judicial review. Eight years later, the case made its way to the BC Court of Appeal. If you're interested in principles of administrative law, you should read this decision. There are interesting and useful things in there about the standard of review on procedural fairness where an administrative tribunal is reconsidering a decision, and about the interaction between decisions of the Provincial Court and administrative tribunals. Really fascinating stuff if you're into that kind of thing (which we very much are). 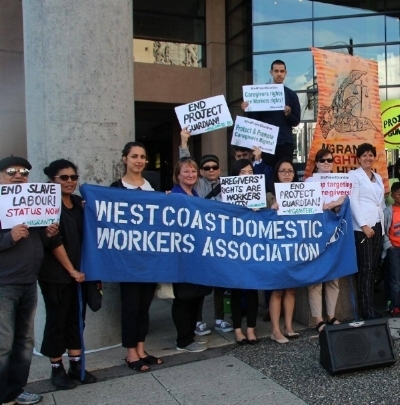 If you're interested in protecting workers' rights, this case is an important victory upholding the right of migrant workers, like everyone else in Canada, not to be charged money for a job. The agency had argued that the provincial law prohibiting these fees, as far as it affected foreign workers, was invalid, because it conflicted with the federal law that - they said -authorized the fees. Provincial employment standards legislation says no one can be charged a fee for finding a job, but federal immigration law says that immigration consultants (like this agency) can charge fees to assist with immigration processes. The agency argued that the employment services were inextricably intertwined with the immigration services since foreign workers must first find jobs in order to apply for work permits and visas. The outcome the agency pushed for was that there would be no protection for migrant workers from being charged fees that no one else in Canada has to pay. The BC Court of Appeal heard this, and said: in Canada, we don't make people pay for jobs. Whether they are local or migrant workers. The Court rejected the agency's argument about the invalidity of the provincial law. The Court said that the laws dealt with different things, and that the provincial law did not interfere with the objectives of the federal law. The purpose of the relevant part of the provincial Employment Standards Act is to protect workers. The purpose of the relevant part of the federal Immigration and Refugee Protection Act is to protect immigrants and temporary foreign workers by regulating who can charge them fees for immigration services. These are not incompatible objectives. The Court of Appeal's decision also rested on the particular wording of the relevant IRPA provision, which changed in 2011. There are no decisions so far answering the same question under the current IRPA. We'll be watching closely for more developments on the laws protecting migrant workers, who are among the most vulnerable people in our communities, from predatory and exploitative recruiters and employers.